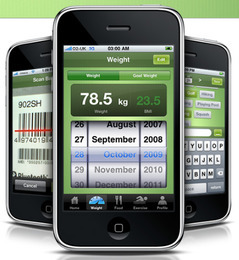 We’ve covered a few iPhone apps that help you lose weight before, but this one is a little smarter than others. It aims to get between you and the chocolate gateau at the purchase point instead of later when it’s sitting in your fridge, looking at you. App Quickka Calories incorporates a bar code reader alongside the standard charts, graphs and data tables that you usually find in dieting aids. Using the iPhone’s camera it can scan the barcode of a product and automatically pull up the corresponding nutritional information. That’s useful not just in the shop when you’re choosing whether to buy something, but it also saves you the fiddly business of typing in the correct figures for the calories you eat after each meal etc. And it also lets you track other things like protein and salt and can then plot the data in a graph. So though I’d prefer it if they spelt Quick properly, it’s quite a smart application. However the catch seems to be that the barcode reader doesn’t recognise all products yet.